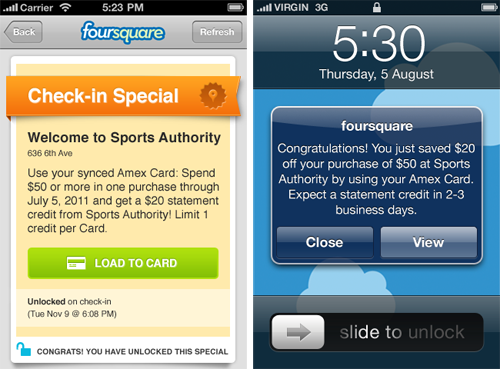 Foursquare’s new deal with American Express will allow AMEX cardholders to save money on purchases at select retailers including Sports Authority and H&M. As important as the deal is, I think the technology is more important. We’ve heard a lot about NFC lately. Products like Google Wallet can talk to the payments network and transmit your credit card, loyalty program and promotion information. I’m sure it will happen over time, but the benefits are marginal at best. Yawn. What’s really exciting is what you could do if you flipped the model and had the payment networks talk to your phone. That’s exactly what foursquare is doing. When you redeem an offer, American Express sends a confirmation to your phone. Risk reduction and increased convenience. If you’ve ever been traveling and had a card rejected because it was flagged as suspicious, you know how frustrating this can be. Instead of declining the transaction, it would be routed to your phone where you could authorize it. This also saves a phone call to unblock your account. Fraud reduction, more transaction volume and operations cost reduction. A credit card company’s trifecta. Online transaction authorization. Similar to above, a notification to your phone could be used as secondary verification of online transactions. Parental authorization. Parents could provide a restricted prepaid card to children. On every transaction, they could remotely approve or deny it. Some merchants could be automatically authorized. This would be a great addition to American Express’s PASS product line. Promotions. Offers based on your recent purchases and location could be sent while you’re in a shopping mood. If you just made a purchase at mall, you might get an offer for discounts on dinner and a movie. Access for the blind. A text-to-speech engine on the phone could provide an overview of the merchant and amount to help the blind. An application like this also eliminates the two-sided market problem that NFC has. As much as Google would like to have NFC terminals everywhere, that will take a long, long time. Merchants don’t have to do anything to the installed terminal infrastructure to make this happen. It’s all between the backend and your phone. It also works with a much broader base of phones than NFC. This type of integration also eliminates the need for training retail employees and doing POS integration. These are both significant hurdles to running promotions.